Happy New Year! Can you believe that we’re 10% through the 21st century? Time flies, and our first meeting of the new year—6 PM, Tuesday, January 25—is almost here. Please come and bring your favorite potluck dish. Drag along a couple of friends too. If you enjoy the Historical Society, why not share the fun with your neighbors? Does anybody remember George’s Oak Room? If you do, you’ll enjoy our program. If you don’t, you’ll learn something historic about our community. Either way, you’ll enjoy great company and delicious food. And, in case there are slides, we have a brand new push- button projection screen in the Clubhouse! If you are receiving this newsletter electronically we thank you for helping us get this newsletter, special announcements and organizational actions out quickly and economically. If you aren’t—but you have e-mail—please let Jim Pearce know your address, and we’ll add you to the mailing list. If you aren’t yet in the digital age, don’t worry—we’ll keep you, the postal service and Ma Bell in business and continue to communicate by mail or phone. In case you haven’t heard, we had a very successful Soup Night in November, earning another $7,400+ for History Center expansion. My thanks and the appreciation of co-chairs Claudia Thorne and Lynn Steen are extended to everyone who planned and contributed time, labor, materials, donations, and everything else to this superb event. We continue to move forward with the new Fair Oaks Boulevard exhibit facility offered by the Fair Oaks Water District. Although the holidays have slowed our progress, we have a new committee underway to develop the vision and themes for this facility, and we expect to make great progress in the upcoming year. Have a safe, healthy and wonderful 2011. The Executive Board is proposing three procedural changes to the By-laws of the Society to improve our timeliness and reduce costs. The full By-laws are available on the Society's web site. Hard copies of the By-laws will be available at the general meeting. Eliminated words are shown in strikethrough. Added words are in italics and underlined. # 1 - Eliminate the requirement that Life Memberships be approved by the members at a general meeting. The Board would review and approve applicants. The current process results in proposed life members paying the required dues but the check and the acceptance is delayed until the next general meeting. 1. A person applying for individual life membership may be accepted upon completion of application, individual life payment and approval by the Executive Board. and a majority vote of members present at a general meeting; and. They shall have all privileges including one voting right. 2. An individual and spouse or two adults applying for family life membership may be accepted upon completion of application, family life payment and approval by the Executive Board. and a majority vote of members present at a general meeting. Each shall have all privileges including voting rights. #2- Change the requirement that By-law changes be sent to the membership at least 20 days ahead of the general meeting to 14 days ahead of the meeting. The 20 day requirement creates hardship for the writers and producers of the newsletter, and may result in a costly separate mailing. Changes the requirement that the full bylaws be sent to all members any time a change to a bylaw is proposed. 11.1 These bylaws may be amended by a two-thirds (2/3) vote of the Active members present at a general membership meeting, provided that written notice of the proposed amendment(s) and those relevant portions of the by laws existing bylaws were mailed to the voting members no less than twenty (20) fourteen (14) days in advance of the general meeting. #3 - Change the schedule of the annual audit so that it is done after the close of the fiscal year. This will allow the Treasurer to get all the year end financial statements from the bank and other organizations for inclusion in the year end report. The audit report can still be made at the first general meeting. 10.1-2 Audit the treasurer's books annually prior to after the end of the fiscal year. 10.1-3 Submit a report of the audit to the president and the treasurer prior to the first general membership meeting executive board meeting of the year and to the Society at the first general membership meeting. 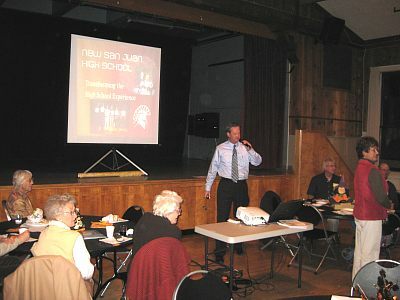 I would like to thank Maria Brugger for inviting Tony Otto, Principal of the New San Juan High School, to be the speaker at the October 2010 meeting. Tony talked about his history in the District and well as the changes that are being implemented in the District today. They are committed to give students job skills for today’s world. Not only will students be prepared for college but they can also choose from five different Career pathways; Construction Technology, Engineering and Design, Hospitality Management/Culinary Arts, Media Arts/ TV and Theater Production, Mechanical Technology. Our January meeting will be stroll down memory lane with recollections of George's Oak Room. I’ve invited former patrons of the restaurant/bar to share their stories with us. I would also like to hear from any of our members that have stories to tell about the Oak Room. I understand that it was ‘THE’ place to visit after a hard days work at either Aerojet or the Pacific Telephone Company. Please search through your old photographs and let me know if you’re able to find any of the glory days of the Oak Room. I’d love to scan them so that we might project them on a screen during the meeting. Docent's Report: The display window in the Fair Oaks library was assigned to The Fair Oaks Historical Society for the month of November. Our display this year consisted of school memorabilia; vintage typewriters, Billy Hinsey's bat boy baseball uniform, San Juan High School year books, 1932 picture of Fair Oaks Elementary School, and other photos. 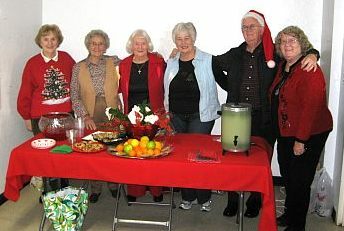 The Christmas open house on Dec. 12 was enjoyed by a few people. refreshments were served. A lively discussion was held on early day Fair Oaks service stations. Thanks to Jim Pearce for bringing pictures and locations of the service stations. The following people have been docents or participated in helping in our activities this year. Thank you ......... Jean Applegate, Lois Frazier, Fran Messinger, Larry & Meg Smart, Cheryl Welch, Jim & Marilyn Pearce, Fran Sargent, Maria & Bob Brugger, Diana Lennon, Ralph & Sherrie Carhart, Mike Maddox, Ken & Lynn Steen. For those of you who attended this years' event you already know what a wonderful time we all had. Between the gorgeous center pieces, the outstanding soups, the beautiful table settings and the entertaining raffle and silent auction we raised $7,400 this year. Once again, a very successful event. I'd like to ask you to personally thank the members of the planning committee. We all put in many hours planning and organizing the day of the event. Committee Members: - Lynn Steen (Bowls), Maria Brugger (Soups), Trude Vasquez (Publicity), Janet and Warren Mc Williams (Bread, Raffle & Silent Auction), Nancy White (Signage, Supplies & Table Set-up), Sallie Miller (Cookies),Bob and Pat Vogel (Wine), Lois Frazier (Center Pieces), Joe Dobrowolski (Tickets) and Sherrie Carhart (Volunteers and Silent Auction pictures). Please also thank Don Yost for all the bowls he made for Soup Night. Tickets will be sold by the table. When you purchase your ticket, a table number will be assigned to the ticket. This will make it easier for you to find your seat when you enter the room. We're considering a Live Auction for a few of the items. Do you have a cabin or time share that you'd consider donating to the Live Auction? Do you know any potters who'd be willing to donate a few bowls to our event? If you do, please contact Lynn Steen with that information. If you plan to only serve on the Clean-Up committee, you will not be required to purchase a ticket for Soup Night. If you wish to attend the event as well as serve on the Clean-Up committee you will need to purchase a ticket. And would you like to be the chair for the Clean-Up Committee? We'll need about 6 volunteers for this task. Lastly, hold Friday, November 4, 2011 for our next Soup Night. Like last year, tickets will be sold at the July meeting so start thinking about who you'd like to have at your table. Thank you for the support you give the Fair Oaks Historical Sociery. The Fair Oaks Water District has offered to allow the Fair Oaks Historical Society the use of the building next to the Sunshine Drive-In on Fair Oaks Blvd as a Historical Museum. We are currently waiting for the Executive Director to sign a year to year, dollar a year lease with the Society. A committee appointed by the President has been assessing the modifications that need to be made before the Society moves our possessions into the building. The committee has been approved to spend up to $5,000 to bring the building into a useable and safe state. Another committee has been appointed to draft a plan for the use of the building and display of the artifacts. The building now has electricity and gas so the lights are on and can be heated and cooled. As soon as the lease is signed the first committee will start work on the building. It needs work on the landscaping, dry rot repair, security and up grade of the flooring. If any member has gardening, woodworking or other house repair skills and have the time and energy to take on a task or work one day as time is available please advise Joe Dobrowolski of you willingness to volunteer. He can be reached at 961-6561 or by email at joedobro@pacbell.net. The Meeting was called to order by President Ralph Carhart following another great potluck. Visitors were introduced. Trude Vasquez showed the booklets about from the Dept. of Corporations about Senior Fraud. Program: Maria Brugger started with the Historical Moment by Janet McWilliams.who shared a memory from San Juan High School. She then introduced Tony Otto, Principal of the New San Juan High School. Tony talked about his history in the District and shared with us what is new about the School. The Commitment of the school has now changed, a new learning community. They are committed to give students job skills for today’s world. Their goal is to have every student ready to enter college when they leave the school, they will also have experiences in five different Career pathways. These pathways are; Construction Technology, Engineering and Design, Hospitality Management/ Culinary Arts, Media Arts/ TV and Theater Production, Mechanical Technology. The school has approximately 600 students, which are grouped in small learning communities. He shared with us the very exciting program. The minutes of the previous meeting were approved as published in the newsletter. Treasurer’s Report: Treasurer Joe Dobrowolski reported that we are collecting emails to start working toward delivering the newsletter by email. New building, some things have been moved to the building. The utilities have been turned on and an alarm is being installed. Soup Night donations have been up to $700 so far. The financial report was published in the newsletter. President’s Report: Ralph reminded us of the passing of Dave Cox and Russ Monroe, past members of the organization. Nomination Committee: The committee has put forth the names of the officers that are now in office to continue for the next year. President, Ralph Carhart; Vice- President, Trude Vasquez; Secretary, Janet McWilliams; and Treasurer, Joe Dobrowolski. History Center Operations: Lois asked for help on the 19th on November for a children's performance. Next Year's Officers: Pete White moved that the Nominations be closed. Motion passed. Warren moved that the officers be made the same by aclimation. Motion seconded. Motion passed. Soup Night: Claudia announced that the dinner is sold out. She also asked that the donations for the raffle need to be in by Friday. Set up will start at 10:00 that morning. Membership: Tel LaBelle reported that we should let him know if they don’t have a badge. Also, to make sure that our dues are current. The raffle was completed, and the meeting adjourned at 8:15 p.m.
1942 - 1978, Everett Reimers, Sr.
Merina West gave a great presentation on the Straith home to the Historical Society at our July meeting, and donated her research binder to the Society. She'll be repeating the presentation at the January meeting of the Fair Oaks Woman's Thursday Club. For those of you who missed the presentation, and to make sure this beautiful mansion gets in the Old Homes binder in the History Center, we decided to do a write-up in this quarter's newsletter. George Straith was a wealthy Chicago clothier and original member of the Chicago - Fair Oaks Association. Straith agreed to be the first of the group to build a home in Fair Oaks and "...pledged to inform the others about his experiences in beginning a life here, his success in fruit growing, his opinions about the climate and other aspects of life in the colony." 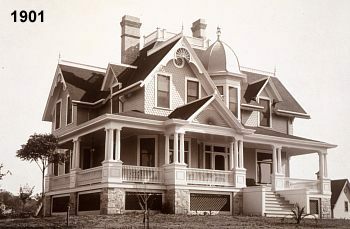 He built the home in 1899-1900. The home was two stories with 14 rooms at about 5300 square feet. It also had a full cellar with 5 rooms containing the laundry, storage and utilities. The layout was modified over the years to please various owners, but with the exception of a room created by enclosing a porch, retains its original shape. Straith became ill about 1915, and he and his wife Inda decided to return to Chicago for treatment. He sold the home to Frank Tropper, a railroad blacksmith. The Tropper family lived in the house until about 1940. Frank died in 1942. About 1930, Everett Reimers married Frank Tropper's daughter Elsie and they had two children, Theresia and Everett Jr. Theresia, ten years older that Everett, Jr., inherited the property on the death of Everett Sr. in 1978, but had moved to Virginia for a long career with a private college and allowed Everett Jr. to live in the house. Marilyn Pearce recalls visiting the house in 1977 and finding Everett Jr., his wife and two children there with Theresia visiting for the summer. She says the place was starting to become overgrown even then. Everett Jr. got divorced sometime after 1977, fell into ill health, and the property deteriorated continuously from the 1980's forward, until the place was so overgrown that many of the neighborhood residents didn't know there was a house there. In 2009, Theresia decided to sell the property to next-door neighbor Kevin Hutton. He cleared all the brush and rubbish, emptied the house of a mountain of trash, and began the work of developing the property. 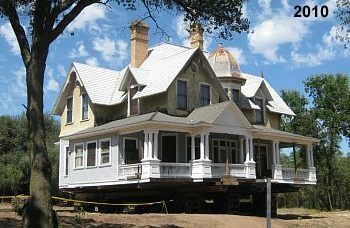 He moved the old home back further from the bluffs and began the necessary structural improvements which will go on for some time. Reminder on dues: Payable for the 2011 year beginning January 1st. (Yes) (No) I would like to receive the quarterly newsletter via e-mail.